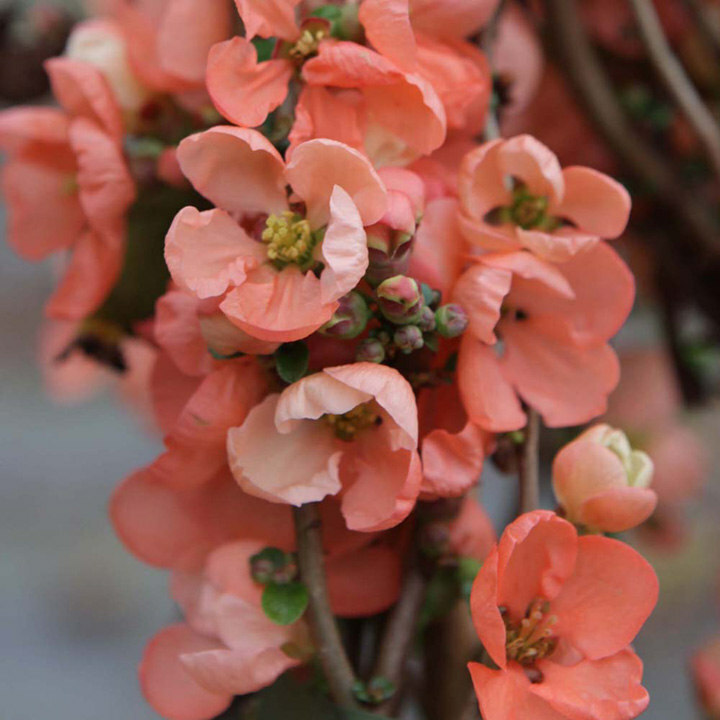 Chaenomeles × superba ‘Salmon Horizon’ (Flowering Quince ‘Salmon Horizon’), a dwarf deciduous shrub with ovate, glossy, dark green foliage. Its flowers are large and salmon-pink in colour and form as clusters. The flowers are followed by green fruit that ripens to a yellow which are also edible. Flowers March-April. Height 90-100cm. Supplied in a 10 litre pot. Chaenomeles × superba ‘Salmon Horizon’ (Flowering Quince ‘Salmon Horizon’), a dwarf deciduous shrub with ovate, glossy, dark green foliage. Its flowers are large and salmon-pink in colour and form as clusters. The flowers are followed by green fruit that ripens to a yellow which are also edible. Flowers March-April. Height 90-100cm. Supplied in a 3 litre pot or 7.5-10 litre pot.